Dragons are scary. The Undead are scary. Undead Dragons are super scary. Often the most badass type of undead, dracoliches are never to be taken lightly. They are always heavy hitting monsters, if not outright bosses. Any Necromancer should do well to seek to have one, or outright become one. It's not a rare thing, however, for these dragons to be weaker than their regular, living counterparts as they inherit the weaknesses of The Undead like Revive Kills Zombie while Dragons rarely have such exploitable flaws. But in some cases, they might instead be literal liches, where so long as their Soul Jar is undamaged, they are Nigh Invulnerable, making them stronger than regular dragons. Often the dragon's classic fire Breath Weapon will be turned into a poison breath or ice blast when they become undead. A specific type of Non-Human Undead. Yu-Gi-Oh! has various dragon monsters, some of which have been revived at various points into zombies or other such things (somehow). Also features in one of the anime's most infamous examples of Screw the Rules, I Have Plot! when Yugi somehow fuses his Mammoth Graveyard (a wooly mammoth skeleton) with Kaiba's Blue Eyes Ultimate Dragon (a three-headed dragon created by combining three copies of the iconic Blue Eyes White Dragon card). This turns the dragon into a zombie, causing its stats to drop each turn as its body decomposes. There's also Berserk Dragon, called Berserk Dead Dragon in the Japanese version. Naga, the Big Bad of the first season of Bakugan, resembles a skeletal Dragonoid. The Skeleton Army from the third episode of Those Who Hunt Elves have a Dracolich. From Digimon, we have Skull Greymon. The Greymon family somewhat blur the line between Dinosaurs and Dragons, but Skull Greymon looks pretty firmly on the dragon side. His bones are as hard as Chrome Digizoid and he has a nuclear missile launcher built into his back, as well as the ability to use cursed breath..
Khajit summons two Skeletal Dragons against Narberal Gamma in Overlord. Skeletal dragons are immune to magic... below seventh tier, that is. Touhou Suzunaan ~ Forbidden Scrollery: The powerful demon sealed in Kosuzu's Night Parade Picture Scroll is briefly depicted as a wingless Dracolich made out of black smoke, complete with Breath Weapon. While there haven't been any signs of skeletal/undead dragons in the conventional sense, one was inadvertently created before Fairy Tail's founding when Yuri Dreyar taking the Tenrou Jade caused the dark magic to fuse his body and soul with a massive dragon skeleton. The spell Mavis was forced to use to save his life ends up having dire consequences for the state of the world even a hundred years into the future. Fairy Tail: 100 Years Quest: Skullion Raider is the Bone Dragon Eater who wears armor made of bones and uses the power of ash to dissolve whatever he touches, all of which invokes the imagery or powers of a dracolich. Magic: The Gathering: Undead dragons — generally represented as creatures with both the Dragon type and either the Zombie or Skeleton types — are not uncommon. The legendary creature Bladewing the Risen is an infamous zombie dragon from Dominaria. Skithiryx, the Blight Dragon , a dragon from Mirrodin that was slain and raised as a skeletal minion by the Phyrexians that overran that world. Dominaria also has vampiric dragons . There are also the zombie dragon Boneyard Scourge , which can return from the graveyard whenever a dragon dies, and the skeletal Bone Dragon . Zombie Dragons are a race of creatures in the Duel Masters card game. "The Four Castles", one of the Adventure Time Graphic Novels, has a zombie dragon who isn't evil and is called Meredith. Split Second has Thorn, the alternate timeline counterpart to Spike. Interesting in that he is not quite dead, but not alive either. He also happens to be a horcrux for Sparkle. Child of the Storm has Gravemoss first pull a Familicide on pretty much every Hebridean Black dragon available, then resurrects them as aerial troops, on a direct course for London as part of HYDRA's counter-blow to SHIELD's Operation Overlord, meaning that there are hundreds of Draconic zombies to deal with. Thankfully, their relatively slow flight speed counts against them and they're intercepted by the RAF, War Machine and Warren Worthington III a.k.a. Archangel. The main villain of the Dragon Hunters CGI movie is the World-Gobbler, an absolutely gigantic skeletal dragon. In Dungeons & Dragons: Wrath of the Dragon God, Big Bad Faluzure, the evil dragon god of decay and undeath, appears as an undead dragon. The Spellbent series has Sap Daddy, an old zombie dragon that has been overgrown by plants. The Year of Rogue Dragons features both dracoliches (in this case literally a dragon turned into a lich) and a vampiric smoke drake (a leftover from the Big Bad's previous attempt to create undead dragons). In The Sellswords, a dracolich is the final boss of a dungeon that Artemis and Jarlaxle raid with a party of adventurers from Damara. In the Craft Sequence, dragons don't have any particular rules or sentimental inclinations about what should happen to their bodies after death, a fact that is very pleasing to human necromancers. Undead dragons were used as weapons in the God Wars, and in Last First Snow the King in Red deploys one to put down an alleged rebellion in his city. Game of Thrones: In the season 7 episode "Beyond the Wall", one of Daenerys' dragons, Viserion, is slain by the Night King and sinks into a frozen lake. It's later dragged out of the ice by the army of the dead and resurrected as a Wight by the Night King. In the next episode, "The Wolf and The Dragon", the Night King rides it into battle and uses it to destroy the Wall. He shoots blue fire, apparently. The Evil Sorcerer in Williams Electronics' Sorcerer pinball summons some sort of ghostly/skeletal flaming dragons, with only their skulls and bony claws visible. Uncle Deadly of The Muppet Show is implied to be a rare benign example, being variously referred to as a ghost and a dragon. The Trope Namer is, of course, the Dracolich, which combines the worst aspects of a Dragon and a Lich. Across the various editions, Zombie, common Skeleton (weaker and stupider then Dracoliches), Ghost, Wraith and Vampire Dragons have all been offered up as well. The advantages and disadvantages of being a dragon undead are all noted. For example, a draconic vampire can't enter a home uninvited... but it turns out a smoldering pile of rubble no longer counts as a home. In 3rd edition, becoming a Dracolich reduced your hit points, which is a large drawback for a beefy creature like a dragon, but it is very easy for the dracolich to regain a body in very short time by possessing a reptilian corpse. The advantage of being immortal could be achieved easier by becoming a Dragon Ghost, which gets a new Breath Weapon and is even harder to kill outright. Of course, it is harder to become a ghost than a dracolich. The latter required, at least in the Forgotten Realms setting, a dragon to simply imbibe a special poison, while you can not exactly decide just to become a ghost. Thanks to several Splat Books, it's possible to have a level 1 Kobold Dracolich (Races of the Dragon, the Draconomicon, Fiendish Codex 1 and Player's Guide to Faerun are all you need). 4th edition has multiple types of Dracolich (ranging from the plain to fossilized dracoliches to dracoliches who only exist in the plane of dreams), as well as multiple types of Zombie Dragons, Skeleton Dragons (the mindless walking dead version of a Dracolich), Wraith Dragons and Vampire Dragons. Interestingly, in the Forgotten Realms the inventor and (until his death in the run-up to the Spellplague) main proponent of dracolichdom was a human — he was an archmage that went crazy, mistranslated a prophecy and decided to help fulfill it. Dracoliches were his solution on how to get dead dragons that are smart enough to rule the world. Pathfinder, following its pattern of revamping boring or classic monsters into something terrifying, has made the Dracolich even more horrifying. Called "Raveners", they maintain their existence by eating souls. 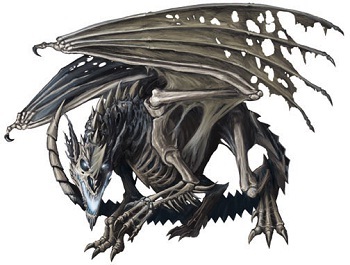 There is also the Wyrmwraith, a ghostly creature that forms from the soul of a deceased dragon (as opposed to the Ravener's intentional transformation into an undead). There are also Umbral Dragons which, while not truly undead, are affected by positive and negative energy ("life" and "undeath" energy, respectively) as if they were undead and can turn their victims into undead servants. Zombie Dragons feature heavily in Warhammer as epically powerful steeds for vampires (and, in some editions of the codex, necromancers), who supposedly journey to a legendary dragon graveyard to find dragon corpses to reanimate. Unlike most undead dragons, though, they are nothing more than mindless automatons, being basically extra-beefy flying zombies. Dragon Dice has the Dracolich as one of the monsters for its Undead faction — it has the usual combination of melee and magic prowess. The Brazilian setting Tormenta only has one, the Dragon King Lich, who in itself isn't that much of a bad guy, which is a good thing because he is the strongest dragon in the entire setting and could be a GREATER DEITY if he so wished. He doesn't, so he contents himself with protecting a cute young lady who can't cook. In The Dark Eye, there was Rhazzazor, an ancient undead dragon who followed Borbarad. Exalted: Just to show that not even the dead are safe from his dickery, the Ebon Dragon has a charm that can turn him into a Creature of Death (i.e., a temporary Dracolich). In 13th Age, the Lich King has a habit of turning white dragons into these, starting with their patron, known simply as the White — thus explaining why white dragons are weaker than other chromatics. The dragons are rarely as on board with this plan as the Lich King is. The castle-sized Dracolich that Sepulchure's fortress is literally built onto. And the Super Ultra Mega Dracolich — it's the size of a planet! MechQuest has 2 examples: The Sepulchure Mech summons a Dracolich (that is also known as Fluffy) and then there is Drakrylos, who is more of a Dragonoid (a Robotic Dragon) that looks similar to Dracolich. AdventureQuest Worlds has The Huge Dracolich Fortress as well, the two Dracoliches at the bottom of the Doomwood Temple, the option to turn your own Baby Dragon to a Baby Dracolich, and Desolich. The Frost Wyrms of the scourge in Warcraft 3 and World of Warcraft are animated dragon skeletons that exhale giant blasts of cold. Sindragosa deserves special mention, having appeared on the latter's login screen for the duration of Wrath of the Lich King and really annoying players with her loud roar. Another one worth mentioning is Sapphiron, a blue dragon slain and raised by Arthas. He too is a raid boss in World of Warcraft in the necropolis of Naxxramas. Though he never actually became a Frost Wyrm, the progenitor of all dragons Galakrond deserves a mention. One of the projects of the Lich King was to exhume the skeletal remains of this IMMENSE (probably the size of a small mountain; just his head, early spine, and right foreleg were excavated, and those alone took up a large chunk of the map) dragon and reanimate it as a frost wyrm. Fortunately (or maybe unfortunately, since the boss battle with that thing could have been epic) players crash this project before it can be achieved. The novel Dawn of the Aspects and the official lore compendium Chronicles revel more about his past. He was essentially already this in life. After eating everything else in his hunting grounds he began to cannibalize other proto-dragons. This twisted and corrupted his very being to the point that eventually the proto-dragons he consumed returned as undead horrors, thereby making him the progenitor and embodiment of necromancy on Azeroth. A Dracolich features as a Bonus Boss in Neverwinter Nights: Hordes of the Underdark. Zombie Dragons (or Dracozombies) are recurring enemies in Final Fantasy games. Spectral/Bone Dragons. Despite looking cool, these dragons are arguably the weakest creatures of their level in any game they have appeared, as they have much lower HP, attack and defense values than average. They make up for it with sheer numbers, though, as V has a building upgrade that increases the number of dragons produced. Spectral Dragons in Heroes 3 do have a redeeming factor in their unique chance to cast a spell upon attack which causes the victims to age rapidly - instantly halving the health points of every unit in the attacked stack, thus making all survivors of the dragons' attack much squishier. Additionally, their sight is so terrifying to behold on the battlefield they reduce the enemy's morale just by being there, something even live dragons usually don't do. They are notable in that Dragons are the only creatures not converted into skeletons when using any "skeleton transformer" type structure. Instead, putting dragons through this will result in one of these (who have better interactions with your undead troops, since apparently even living dragons are fearful of the dead). In the fan-made Game Mod of the third game, "In the Wake of Gods", the Spectral Dragons can be upgraded further to make them less underwhelming. Those dragons are on par with Rank 8 creatures in terms of power. One of the possible upgrades is actually called the Dracolich, and with the ability to shoot plague clouds just like a regular Lich, only much more powerful. The other one, the Ghoul Dragon... hoooo boy. It retains all the strong points of the Spectral Dragon and takes them Up to Eleven. In addition to being all-around stronger and faster, they reduce enemy morale twice as much as Spectral Dragons do, can still execute an aging attack, and most terrifyingly, drain life from living units upon attack just like Vampire Lords (themselves a borderline Game-Breaker) do. Their low health comparatively to live dragons is not improved, but the vampiric attack allows them to revive fallen members of the stack with utmost ease. In Guild Wars 2, Zhaitan's lieutenants are all dracoliches. Zhaitan himself appears to be several undead dragons mashed together, with a half-dozen heads and nine wings(the ninth is malformed and useless in flight). In Fire Emblem Gaiden, one of the few Fire Emblem games to include monsters as enemies, Draco Zombies are very powerful enemy units who attack by biting. The bizarre Physical God Duma appears as a slime-covered dragon-shaped being with exposed muscle and bone, best depicted in this fanart . Unlike most examples, Duma is fully sentient and has a sense of honor. In Fire Emblem: The Sacred Stones, the Draco Zombie class returns as a boss of the second-to-last map, now using a poisonous Breath Weapon known as Wretched Air. On the penultimate map, there are two. And on the final map, the Big Bad may choose to summon these as mooks. Gets worse in the Lagdou Ruins, where the final map features no fewer than seven of them. Now you know why you've been saving up all those S-Ranked weapons. Thankfully, bows are also effective against them. The Malig Knight class in Fire Emblem Fates combines this with Dragon Rider as they ride Undead Wyverns. Tear Ring Saga has Dracozombies, just like Gaiden, and Sacred Stones, they're a Boss in Mook's Clothing. Zombie Dragons appear in Ogre Battle as top tier dragon units created by using an Undead Ring on a Tiamat. In MARDEK's second chapter, the dragon that was the grand hero Social Fox's last battle enjoyed the fight so much that it came back to life in hopes that he would too, so it could fight him again. Ultima Online has Skeletal Dragons. A few undead dragons (usually of the skeletal variety) have appeared as bosses and enemies in the Castlevania series. Castlevania: Circle of the Moon has a Dual Boss where you fight two zombie dragons at once. Whichever one you don't kill first starts eating the other's corpse in order to heal. Castlevania: Lords of Shadow has a colossal lich-possessed skeletal dragon that's even named 'Dracolich' as it's penultimate boss. Castlevania: Portrait of Ruin has a zombie dragon as a unique (but respawning) enemy inside the Egyptian tomb, with many blades and weapons embedded in its body. Ninja Gaiden (the new-gen series, not the original NES trilogy) has one of these serves as the boss of Chapter 7 in the first game. There are Dragon Zombies in Valkyrie Profile, but they're a slight subversion in that, being both draconic and undead, they're vulnerable to spells that specifically target both and are actually not that big of a threat. One combo by a character with a dragon slayer or undead-targeting weapon and they're done for. The humorous browser-based MMORPG, Kingdom of Loathing, has an undead boss monster in the Cyrpt (near the Misspelled Cemetary) called The Bonerdagon. It's an undead dragon made of bones, not to be confused with an undead rdagon made of bones, and certainly not to be confused with an undead dagon made of boners. A few have popped up in Tibia. Super Mario RPG: When the Czar Dragon is defeated, it falls into a lava pit and reemerges as the skeletal Zombone. The first boss in Demon's Crest. The Dragon Zombie class in the Disgaea series starting with the second game. They take halved damage from physical attacks, and boast very high defense and attack stats, but do poorly against magical attacks, especially wind (Though that problem can be remedied for one on your side). Their Darkness Breath is also generally one of the strongest area attacks in the game. They're rather dim compared to normal dragons, but this doesn't come up much. The Queen of Blackmarch in Dragon Age: Origins  Awakening is not a zombie dragon but a ghost dragon. She is the baddest Bonus Boss in the expansion. The Archdemon in the original game might also count. There are several types of Dracolich in Dragon Cave, like the Vampire Dragon and Undead Dragon species. Stallord in The Legend of Zelda: Twilight Princess is a ginormous dragon skeleton (later just skull) reanimated by Zant. Volvagia in Ocarina of Time is stated to have been killed by an ancient Goron warrior and later revived by Ganondorf. He seems to have gotten all his flesh back, though, so it's not really apparent just from looking at him that he's undead. A fan theory is that Stallord used to be Volvagia, this time revived but not getting his flesh back. Onox's true Dark Dragon form in Oracle of Seasons has a distinctly skeletal look as well. Epic Battle Fantasy has zombie dragons in the second and third games. Bone Dragons appear in Yoshi's Story. Bonetail from Paper Mario: The Thousand-Year Door. Bonetail is a bit of an odd example, as he is explicitly stated to have never died. His flesh just rotted off over the ages and he kept living regardless. He otherwise fits all staples of the trope perfectly. Dry Bowser from New Super Mario Bros..
Giratina has large spikes protruding from its body that resemble ribs, and is also part Ghost-type. It takes this even further by not only representing antimatter in the Pokeverse, but also being an Eldritch Abomination akin to that of Yog Sothoth. Kyurem from Black/White and Black 2/White 2 is a zombie dragon from outer-space that is stated to have a taste for human flesh. However, it's not malevolent. The storyline to Black 2/White 2 reveals that all it wants is to be whole again. One level of a Battle for Wesnoth campaign features a Scheletrical Dragon as enemy leader. Despite possessing no weapons besides its claws and jaws, it's still incredibly powerful. Both feature the Dracoliche in the Plane/Shard of Fear, a (at the time of their release) very tough boss monster. Strangely, thanks to its immunity to magic-type spells, it was immune to spells that worked against undead and dragons. There's also Trakanon, who is more of a zombie-dragon, but follows most of the criteria. Bone Daddy from Solomon's Keep, who spits out poison along with maggots. If you try to be funny and stay out of his poison spit range, he stomps the ground, causing his bones to fly all over the place to damage you. A Skeleton Dragon appears during a College of Winterhold quest. As expected, killing it doesn't net you a dragon soul. It is also weaker than live dragons and cannot fly. Durnehviir from the Dawnguard DLC states that he is caught "between laas and dinok, between life and death", and certainly looks the part. He's a dragon that explored necromancy to the point of selling his soul in exchange for power to the Ideal Masters, rulers of the Soul Cairn where all souls sacrificed for necromancy end up. During his imprisonment in the Soul Cairn for over 4000 years, his body is warped to a rotting skeletal version of his former self ◊. The Ideal Masters did keep their promise, though, and granted him powerful necromantic abilities which he uses in combat. After an awesome battle with Durnehviir, the Dragonborn is told that Durnehviir is no longer a normal being and his body can reconstruct itself, which it later does. 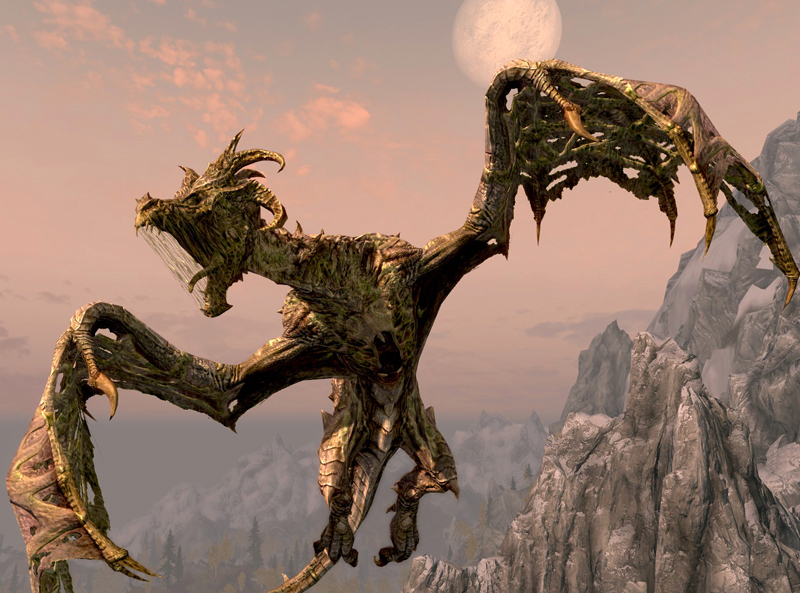 Out of respect, he then grants the Dragonborn the ability to summon him from the Soul Cairn for a short time, to aid the Dragonborn in battle (which benefits him as well because it grants him even a momentary reprieve from his imprisonment) He's pretty much an ideal Dracolich, even if he never technically 'died'. The fourth "skin" of Raptros from War of the Monsters is a skeletal dragon. This is pretty much the final boss of Dark Messiah of Might and Magic. It appears that Godcat is going to have this for backup for one part in Epic Battle Fantasy 4. The Undead Dragon is the final boss of Gothic II. Skeletal dragon enemies feature in Drakan. In Dragon Strike a fight with a dracolich takes place above Dargaard Keep. Combined with Dinosaurs Are Dragons in MediEvil 2, the result is a fire-breathing, fossilized Tyrannosaurus Wrecks. Breath of Fire II presents the "Necroman(cer)", the One-Winged Angel form of Father Mason. It takes the appearance of a skeleton dragon with remains of skin, muscle and organs in its wings, back and ribcage; and it has the power to control undead zombies. In Breath of Fire III, shortly after Ryu matures into an adult, he and Garr face off against the Dragon Zombie, a skeleton dragon created by the clan's enmity towards Garr. This fight is either really easy (if you have the Kyrie spell, which is either a Guide Dang It! to acquire through the Master system, or naturally gained by Garr if sufficiently leveled-up), or devastatingly tough (as your main healer in the battle, Ryu, is also your main damage dealer, and he can't do both). Breath of Fire IV has the Dragonne, a zombified dragon that's half-way rotten, with patches of flesh missing here and there, most visibly in its jaw. Breath of Fire: Dragon Quarter has the dragon Odjn, who's a corpse pinned to a wall. He makes a pact with the main character Ryu, and gives him access to the Wyrm powers. Undead dragons are very strong, non-respawning enemy. One perches off a ledge, seemingly dead until someone picks up items placed nearby. What is more unsettling is that a certain area is populated by nothing except the lower halves (read: only the leg part, no head, no torso, nothing) of said undead dragons. Whatever happened to the upper parts? Nobody knows. There's another undead dragon in the Painted World, split into two halves. The upper half protects a bridge and vomits poison if you try to cross. Seath the Scaleless is referred to by Big Hat Logan as a "true undead", thanks to the power of the Primordial Crystal he stole after the war on the Everlasting Dragons. One of the bossfights in Dragon Valor is a skeleton dragon named Hades. Dungeon Crawl has reanimated dragons of the skeletal or zombified varieties (and spectral and simulacra versions, if you want to be thorough). There are also Bone Dragons, which are a seperate kind of monster altogether that pack a huge punch and have tons of HP. Dispel Undead is your friend. RuneScape has Revenant dragons, which are the cursed ghosts of dragons slain in the God Wars. Skeletal wyverns, however, are explicitly not undead. They are reanimated piles of bones, and anti-undead spells don't work against them. Wonder Boy III: The Dragon's Trap has a Mummy Dragon and a Zombie Dragon, not to mention the Vampire Dragon at the end. Though not appearing in Skylanders, Malefor does appear in the backstories of certain characters, and has been Retconned into an undead dragon. Quigley believes Cynder came Back from the Dead, in which case she would be a dracolich too. The Bonus Boss of Dragon's Dogma is an undead dragon known as the Ur-Dragon. Starbound has the Bone Dragon, a huge skeletal dragon boss. It still breathes fire, however. It's revealed that it's actually a robot made to look like a skeletal dragon, and as it takes damage you see the mechanical parts underneath. The zombie dragon is the most powerful non-deity Earth creature in Lost Kingdoms. The Dust Dragon in Forgotten Worlds is a giant, dying and half-rotten red dragon. Its stomach is wide open, giving the player a nice veiw of its entrails and ribs, which it uses to attack. The Death Dragon/Diaboros in Monster Rancher is an animated dragon skeleton that can be obtained either from certain discs or combining a Dragon with a Joker. Dragon Quest Monsters has the Skullgon/Skelegon, a lower ranking monster that's usually created when you merge a member of the Dragon family with a member of the Zombie family. Puzzle & Dragons has the Zombie Dragon and Corpse Wyrm, as well as their evolved formes. In Suikoden Tir has to defeat one to gain cantrol of his castle. War Dragons has Bolt, Yanari, Habrok, Ladon and several more Undead Dragons that are skeletal. In Bravely Default, one of these must be fought when trying to enter Eternia. Can become an Anti-Climax Boss due to how Revive Kills Zombie is in effect. Total War: Warhammer: Zombie dragons are available as a high-level steed for Lord units of the Vampire Counts. They can fly, which allows them to easily bypass terrain obstacles and enemy units, and are very powerful in combat. Unlike other examples of this trope, they are just reanimated dragon corpses, simply another type of puppets bound to their masters' will. Dandy Dungeon has Bone Dragons, which are almost a Boss in Mook Clothing. They're tough, deal lots of damage, can breathe fire and poison. Shows up as a boss in the rare PAL exclusive game Kaan: Barbarian's Blade. One of the only three bosses in the entire game. Monster Hunter: World features Vaal Hazak, which probably isn't actually undead, but has a rotting, skeletal appearance and has the power to control decay-related gases, absorb life force from other monsters, and revive those same monsters to attack the player. Several other Elder Dragons in earlier games resemble undead beings as well. Gogmazios in Monster Hunter 4 Ultimate looks like a corpse that crawled out of a tar pit, while Nakarkos from Monster Hunter Generations is a giant cephalopod that excretes an adhesive substance to coat itself in its victims' bones. It tops its front tentacles with dragon skulls to give the false impression of being a two-headed hydra. In Wizard 101, the rank 8 Death spell "Skeletal Dragon" summons one of these as an attack. Impressive Title: In Wyvern Hills, there is a rare chance for a Zombie Dragon to spawn, which is actually an undead wyvern with an angelic halo above its head. They are renowned for being one of the toughest enemies in the game thanks to their Regenerating Health and Multiple Life Bars. Wonder Boy III: The Dragon's Trap has a Mummy Dragon, a Zombie Dragon, and a Vampire Dragon. 8-Bit Theater: As the final test of overcoming their inner demons at the Castle of Ordeals, the Light Warriors have to battle a giant skeletal dragon. As Fighter explains, "Maybe the bone dragon represents our skeletons. Those are inside of us. Like skeletons." Thief defeats the dragon by stealing its vertebrae. Xykon temporarily uses a zombified dragon (#429 and onwards, explicitly calling it a zombie in #441). Vaarsuvius casts Create Greater Undead on a black dragon's head. However, this is for the express purpose of casting Familicide on it, thus killing everything that had any familial connection to that dragon. "Bone Dragons" are the primary antagonists in The Clockwork Raven. One short based on How to Train Your Dragon involves the heroes being attacked by a skeletal dragon called the Bone Knapper. However, it's revealed at the end of the short that the Boneknapper is actually friendly and that it just wanted its collarbone (which allows it to roar) back. The Boneknapper isn't really skeletal, however. It just wears bones that it finds along the ground as armor. In the Grand Finale of Transformers Prime, Unicron raises and commands a swarm of zombie Predacons. That's an entire army of undead alien robot dragons.